-Always be aware of your surroundings and who is around you. Take time to observe what people are wearing and what they look like in case you have to describe it later to someone. -Do not leave any items in your car that may be seen as valuable to someone else. Do not give thieves the opportunity. Put valuables in the trunk or cover them so they are not visible from the outside. -Do not leave packages on your door step or allow mail to pile up at your door. It is a sign that you are not home or that you do not care for your mail. 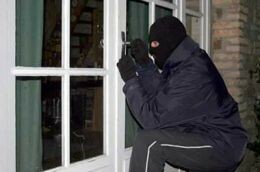 -Leave a light on throughout the night inside or outside your house to tell burglars you're at home. -When attacked, strike back by hitting a vulnerable spot or create a distraction to flee quickly. -Do not fight back for your possessions if the thief is armed. -Be cautious of strangers who want to use your phone. -Check the floor and backseat of your car before getting in. -Be defensive when driving. Park in well lit areas and gather all of your items before getting out. -When using public transportation, wait in well lit areas, stand near other people, and use a schedule that reduces your wait time. But above all, be aware of strangers. -While at home, do not answer the door for anyone that puts you in an uncomfortable situation. -Keep doors and windows locked, install deadbolts on exterior doors, and have a lock on your bedroom door. These simple things can keep you a lot safer and promote others to be safe as well.